Parcel scales, which calculate the total weight of a product or item for shipping, are used in mail rooms and offices across the country to quickly determine the required postage for a package to be mailed. Accuracy is a must. Many can be bought used from licensed dealers, but these should be inspected for accuracy before being put into commercial use, and if necessary, they should be refurbished. Brand new scales will be more expensive, but it may be worth the cost to your business in the long run, as these can be used longer before needing repairs or replacement. Because parcel scales are designed to be used in shipping, they should have a wide enough platform to safely hold the sizes of packages your company normally ships. These scales should also have easily visible readouts. Price ranges vary based on size, capacity and accuracy, with the most important feature for any business being accuracy. Even the slightest discrepancy in the can affect the cost of postage. 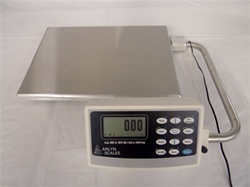 Parcel scales can technically be used in a number of other applications, such as warehousing and science labs, but are extremely efficient in their intended purpose. They are an integral piece of equipment for sales, logistics and purchasing departments. All aspects of the company are ultimately affected by the reliability of the scales that are used in the mail room or warehouse. These scales are in common use across all industries today. Differences in manufacturing methods used to make scales, as well as the quality and durability of internal components make the difference in whether or not you have a reliable scale. Parcel scales used in mail rooms should be easy to set up and operate, and they should be calibrated correctly according to either the metric or English standard system, depending on which your company uses. One of the first companies to produce a reliable scale for shipping and postal use was a manufacturing company, which started in 1830. Since then, scales have evolved and improved in accuracy as well as features. The ability to count individual parts and finished goods and to connect to a computer to store data has enabled companies to better track their work-in-process as well as items being prepared for shipment. Because postal rates are largely based on weight, it has been necessary to determine postage by measuring the total weight of each package, as well as the dimensions. Packages with irregular dimensions generally cost more for postage than standard square or rectangular shipping containers. Some scales will let the user enter dimensions of an irregular package for more precise postage calculations, taking into account the weight as well as shape of the package. Digital parcel scales are the most convenient method of preparing items to receive postage. For the parcel scale of your choice be sure to contact Arlyn Scale at www.arlynscale.com today!